the world is mine: its a memories..
LONDON – Millvina Dean was only 2 months old when she was wrapped in a sack and lowered into a lifeboat from the doomed Titanic. Now 96, the last survivor of the tragic sinking is selling mementos of the disaster to help pay her nursing home fees. Rescued from the bitterly cold Atlantic on that April 1912 night, Dean, her 2-year-old brother and her mother were taken to New York with nothing but the clothes on their backs. Before returning home to England, they were given a small wicker suitcase of donated clothing, a gift from New Yorkers to help them rebuild their lives. Now, Dean is selling the suitcase and other Titanic mementos to help pay her nursing home fees. They are expected to go for $5,200 at an auction of Titanic memorabilia Saturday in Devizes in western England. Among the items are rare prints of the Titanic and letters from the Titanic Relief Fund offering her mother one pound, seven shillings and sixpence a week in compensation. But the key item in the sale is the suitcase, said auctioneer Andrew Aldridge. "They would have carried their little world in this suitcase," he said Thursday. Dean has lived at Woodlands Ridge, a private nursing home in the southern city of Southampton — Titanic's home port — since she broke her hip two years ago. "I am not able to live in my home anymore," Dean was quoted as telling the Southern Daily Echo newspaper. "I am selling it all now because I have to pay these nursing home fees and am selling anything that I think might fetch some money." A spokeswoman for Woodlands Ridge said Dean was too tired Thursday to speak to The Associated Press. She said rooms at the nursing home cost between $1,000 and $1,550 a week, depending on the level of care the resident needs, but declined to discuss Dean's situation, saying it was a private matter. Although Britain has a free health care system, private providers offer more comprehensive services for a fee. In the case of nursing homes, state-run facilities are available and cost much less than private ones. But they are more spartan and offer fewer amenities, such as shared rooms and no private TVs. Local authorities often pay a portion of the costs of private nursing home care based on an individual's assets; anyone with more than $39,000 in assets has to pay their own fees. In 1912, baby Elizabeth Gladys "Millvina" Dean and her family were steerage passengers emigrating to Kansas City, Mo., aboard the Titanic. Four days out of port, on the night of April 14, 1912, it hit an iceberg and sank. Billed as "practically unsinkable" by the publicity magazines of the period, the Titanic did not have enough lifeboats for all 2,200 passengers and crew. Dean, her mother Georgetta and brother Bertram Jr. were among 706 people — mostly women and children — who were rescued by the steamship Carpathia and survived. Her father, Bertram Dean, was among more than 1,500 who died. Dean did not know she had been aboard the Titanic until she was 8 years old, when her mother, who was about to remarry, told her about her father's death. She has no memories of the sinking and said she preferred it that way. "I wouldn't want to remember, really," she told The Associated Press in a 1997 interview. Dean said she had seen the 1958 film, "A Night to Remember," with other survivors, but found it so upsetting that she declined to watch any other movies about the disaster, including the 1997 blockbuster "Titanic," starring Leonardo Di Caprio and Kate Winslet. 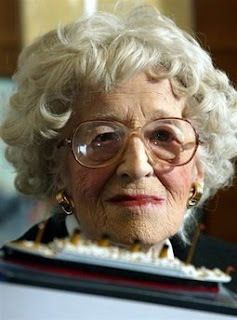 Dean began to take part in Titanic-related activities in the 1980s, and was active well into her 90s. She visited Belfast, Northern Ireland, to see where the ship was built, attended Titanic conventions around the world — where she was mobbed by autograph-seekers — and participated in radio and television documentaries about the sinking. The last American survivor of the disaster, Lillian Asplund, died in 2006 at the age of 99. Another British survivor, Barbara Joyce West Dainton, died last November at 96. Aldridge said the "massive interest" in Titanic memorabilia shows no signs of abating. Last year, a collection of items belonging to Asplund sold for more than $175,000. "It's the people, the human angle," Aldridge said. "You had over 2,200 men, women and children on that ship, from John Jacob Astor, the richest person in the world at the time, to a poor Scandinavian family emigrating to the States to start a new life. There were 2,200 stories."